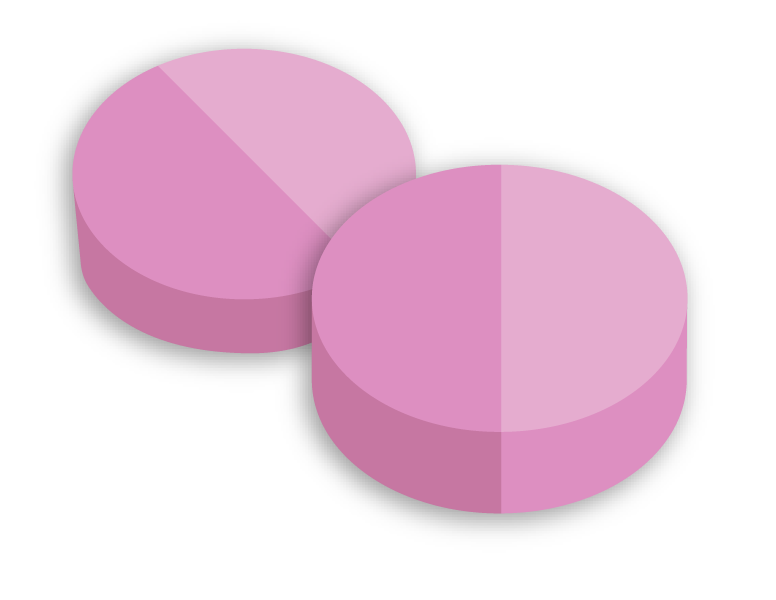 Each chewable tablet contains 3 billion active cells, concentration guaranteed until expiry date. Sucrose, sorbitol, microcrystalline cellulose, maltodextrin, corn starch, inulin (prebiotic), natural grape flavor, citric acid, anthocyanin and red beetroot, magnesium stearate, silicon dioxide, ascorbic acid. take 1 tablet twice a day at breakfast and at supper. Dissolve or crush tablets to prevent choking. Take 2-3 hours before or after antibiotic. * This product does not contain: gluten, soy, peanut, tree nuts, sesame, eggs, fish, shellfish, wheat or sulphites. This product may contain traces of dairy proteins. Our little one’s deserve to put all their chances… and good bacteria… on their side! Their curiosity and contact with other children in different environments increases their susceptibility to infection. Furthermore, the fact they have energy to spare can increase their nutritional needs and their risk of deficiencies. Many also suffer from constipation, while others have diarrhea following an antibiotic treatment. Finally, in other infants, allergies, intolerances and eating whims limit the diversity of foods on the menu. To face these many challenges, probiotics can offer respite to young children… and peace of mind to parents. 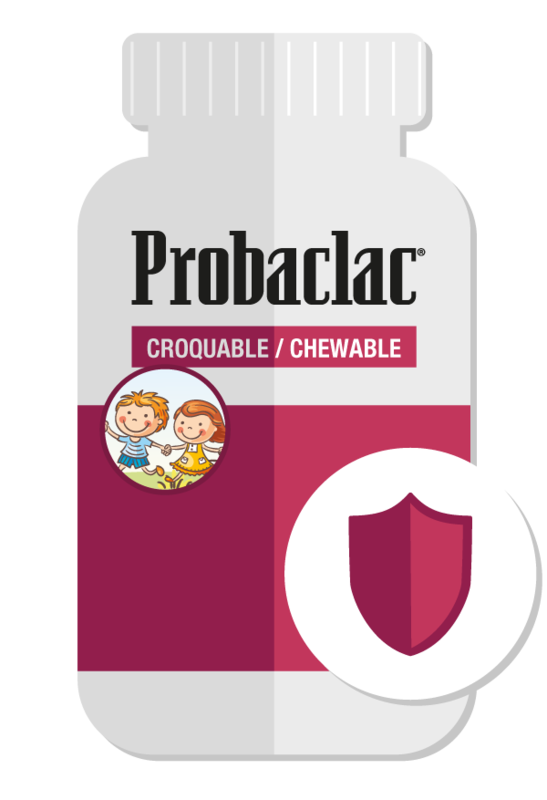 To avoid the inconvenience caused by food allergies or intolerances, or when taking antibiotics, give Probaclac Chewable to your children. 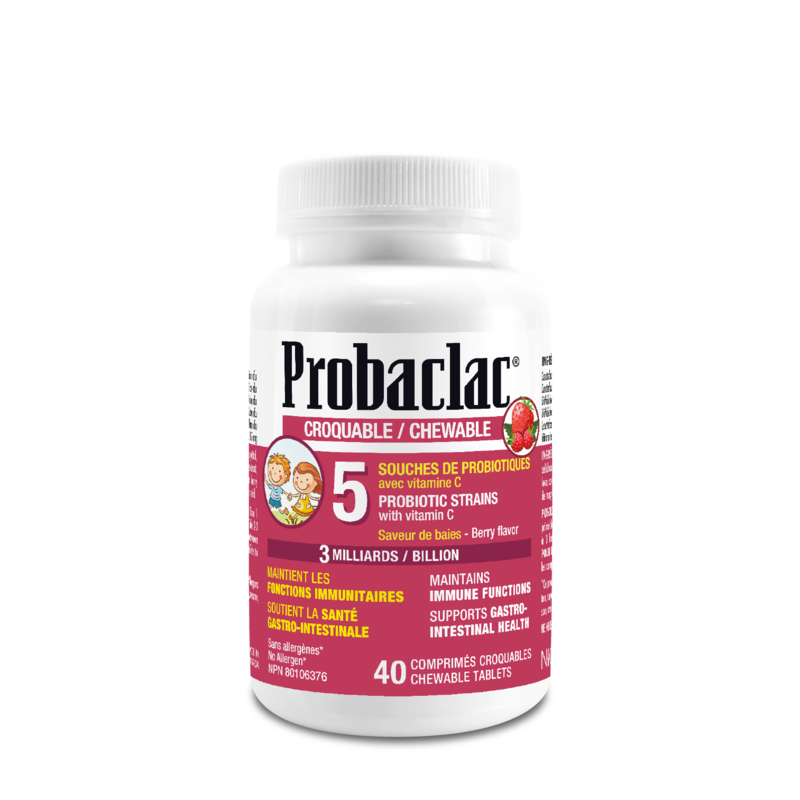 HOW TO TAKE PROBACLAC CHEWABLE FOR CHILDREN ? From the age of 3, strengthen their digestive, immune, respiratory and urinary systems with no less than 6 human probiotic strains adapted to their needs. At birth, the microbiota of babies is mainly composed of bifidobacteria ; thus the Children’s supplement contains several lactobacilli (Lactobacillus rhamnosus, casei, acidophilus and paracasei) as well as some bifidobacteria (Bifidobacterium breve and longum) to balance their intestinal flora. Additionally, the dosage of 3 billion active cells is in line with the recommendation of the Canadian Pediatric Society. The product doesn’t contain priority allergens, it is gluten and soy free, but may contain traces of milk proteins. Our low in sugar without artificial agents chewable tablet tastes good and is crumbly to add to foods or drinks.